My first 2 births were induced for various reasons (#1 I was 42+3 and didn't know any better, was pressured into an induction. Baby was born 9lb 2oz after 4 hours and an episiotomy). Baby 2 was induced at 37+2 because my waters had been leaking for 2 weeks and they were afraid of infection. I didn't realize they were only hind waters and allowed myself to be pressured into unnecessary induction. Baby 3, my daughter. Her waters broke in a huge gush at 30+3, stinking like rotten eggs. Rushed by ambulance to hospital, where they didn't seem to care, my water turned yellow overnight. They monitored me on the ctg, I had several contractions over the day. I also began to get very ill - temp went up, nauseous... but they still waited. I could have been induced, but they didn't care. Eventually they said it was obvious I had an infection (it turned out I had a uterine infection before my waters broke anyway) and they took me up for an emergency caesarean. 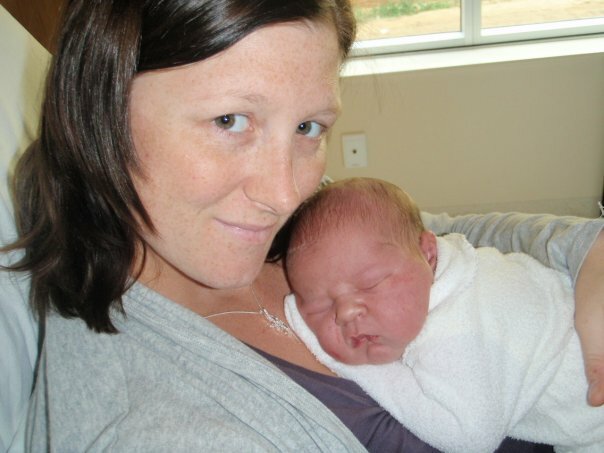 Baby was born breathing, but my uterus and placenta were yellow with infection. they said 12 more hours, maximum, and my daughter would have been born still. She was taken away with me barely seeing her, and she spent the next 28 days in hospital. My recovery was slow and hard, I was very ill from the infection for days, and spent 10 days in hospital. I didn't mind being in hospital, as I was closer to my daughter and could see her any time. -What made you desire a VBAC ? This is almost unheard of these days. I wanted a VBAC because I'd had 2 vaginal births before my c/s, and knew that not only could I birth naturally (and easily!) but also I did not want another c/s unless it was needed. I got myself a doula, and my local hospital pretended to be supportive (when they really weren't, they made my life hell, even through labour). But my doula was my strength :) My GP/OB was also supportive, it was just the hospital that was the problem. -How did you prepare for your VBAC? I was on such a HIGH!! I felt amazing, didn't even get the blues. I felt so great I couldn't wait to do it again!